DIY Fuel Injector Cleaning is a process that can be accomplished fairly simple and easy. That’s to say if you base it on YouTube videos and some internet sites. An on-off switch is connected to a battery. The other side of this switch is then connected to the fuel injector to be cleaned with a set of wires. The injector is opened and closed by pressing the switch. While the injector is open carb and choke cleaner is then forced through the injector with a syringe. This is done a couple of times per injector and BAM!…. instant results. DIY fuel injector cleaning projects are almost always a failure, dangerous and pose a fire hazard. DIY’ers do not have the proper equipment to test, measure, verify and clean the internals of the fuel injectors. With the proper fuel injector cleaning equipment and chemicals it takes the professionals about 45 – 60 minutes of actual cleaning time to clean a single or set of fuel injectors. During this time the injectors are opened and closed 20 000 to 30 000 time whilst they are inside an ultrasonic bath. Do you really believe that a couple of squirts with carb and choke cleaner can achieve the same result? By the time the DIY’er collected, made and or purchase the necessary equipment to make the injector cleaning attempt successful they would almost always have spend more time and money than what it would have cost to send the injector set for professional fuel injector cleaning. Leaking fuel injectors: Does the fuel injector pintle, ball or disc properly seal or seat under operating pressure, thus preventing the fuel injector from leaking. Volume: The amount of fuel delivered under operating pressure and under various loads. Atomization: How well the fuel being delivered is atomized at various rpm. Distribution: The length or depth and the width of the spray pattern. In most instances the DIY’er does not have the ability to accurately and under operating pressure, measure how much fuel the injector delivers before and after the cleaning process. There are some that recommend that theses test been done using the fuel rail and fuel from the vehicle. This recommendation is irresponsible, dangerous and pose a real fire hazard that could cause severe injuries or even death. If you want to save time and money then read our article on fuel injector cleaning methods. For a fast and reliable injector cleaning service click here for shipping instructions and let’s get started today! Cleaning fuel injectors at home by soaking them in, or flushing them with carb and or brake cleaner does absolute nothing. It might flush out “some” loose dirt and grime but, that’s about all. If, as suggested in some of the YouTube videos, you start the DIY fuel injector cleaning process at the inlet side of the fuel injector there is a very good chance to lodge loose dirt and grime between the pintle and pintle sleeve. 100% of fuel injectors we have tested after they were cleaned via a DIY fuel injector cleaning project failed the minimum acceptable performance standard for that specific fuel injector. click here for shipping instructions and get started today! During the DIY fuel injector cleaning process the spray pattern which indicates atomization and distribution cannot be verified. 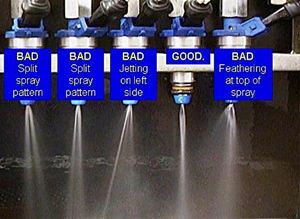 The spray pattern of a fuel injector is very important the performance of the engine. It can also be determine the amount of Hydrocarbon [HC] and Carbon Monoxide [CO] that will be emitted. Incorrect or poor fuel injector spray patterns can cause a wide range of drive-ability issues such as emissions, poor starting, poor fuel consumption and even engine detonation. The five fuel injectors in the image on the right flows exactly the same amount of fuel. It is the spray patterns that is noticeably different. For all intense and purpose the engine should perform properly because all the cylinders are getting the same amount of fuel but not so. Fuel atomization and distribution factors were causing this engine to throw misfire codes and engine performance was noticeably down. These problems can never be picked up during a DIY fuel injector cleaning project. Last but equally important is the ability to check if the fuel injector pintle, disc or ball properly seal under operating pressure. Leaking fuel injectors are a fire hazard and can cause many serious and expensive problems. Time, money and resources invested in the DIY fuel injector cleaning project almost always will cost more than what it would have cost if the fuel injectors were sent to a professional fuel injector cleaning and flow testing facility such as Injector Rx. Ultrasonic fuel injector cleaning and flow testing is the only process that can guarantee reliable and complete fuel injector cleaning. Even with the proper tools, professional fuel injector cleaning equipment and specialized ultrasonic cleaning solutions it still takes us here at Injector RX about 45 – 60 minutes to properly clean injectors.